From Goodreads: "We know you are here, our brothers and sisters . When Pressia meets Partridge, their worlds shatter all over again." I borrowed an ARC of this book from a friend who wasn't sure if they were enjoying it. So she gave it to me to read to see if I enjoyed it. With this book that is a tough question to answer. It's safe to say that this book is very unique. 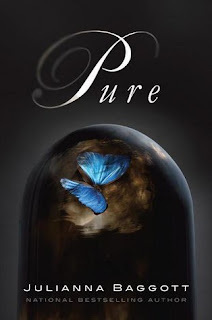 Pure is not like anything I have ever read before. It was hard for me to decide what rating to give this book, it was either going to be 3 or 3.5 stars. I contemplated not finishing this book, the first half of the book was tough for me to get through, it was slow moving and mainly setting up the world the characters live in and giving background on what has happened. I know this was necessary since it's the first book in a new series but I just couldn't get into it. However the second half made up for this. The second half was action packed and twists were revealed that I wouldn't have even thought to expect. I was expecting there to be a love triangle, and here was me thinking 'not ANOTHER love triangle, I can't cope!" But no I was wrong, there was no love triangle... But I won't tell you why, for spoiler reasons! Pure follows the story of Pressia, Partridge and Bradwell. They live in a world that has changed drastically. A dome has fallen on their town and unless you were within the dome when it fell like Partridge was, you became literally attached to the closest object to you. For Pressia it was a baby doll, which she now has as a hand. For Bradwell it was birds, he now has birds on his back. This blew my mind. The birds didn't die, they still flap their wings and everything. Pressia and Bradwell were lucky, others not so much. Some people were only close to the ground or glass or something else solid that caused them to die a very unfortunate death. For those inside the dome life seems perfect, they don't know what goes on outside and most of them see no reason to care. Partridge used to be one of them. Until he breaks out, something that has not been done before. He breaks out and sees what life is like outside and begins to hate is Father who is the equivalent of a mayor for inside the dome. Julianna Baggott has succeeded in creating such a unique story that the idea alone is enough to warrant you reading this book. I'm hoping that the second instalment of this book will be more action filled and fast paced. Obviously this first book has to set up the world that the characters live in and that takes a bit of time, now that this has been done, hopefully the second book will pick up the pace! I did enjoy this book and if this sounds up your alley then you should give it a go! Have you read Pure? I'd be interested to hear what you thought of it! It was definitely worth the read, I agree it was more crossover adult-ya! I just finished reading it today, and I agree, I can't really figure out what to give it. It was unlike anything that I've ever read, even in the dystopian genre. It was undeniably very unique out of all the books I have read so far anyway, but I'm still on the fence about it! *shudders* the fusings and everything in Pure SERIOUSLY squicked me out. It's SOOOOOO SLOOOOOOOW in the beginning, but you're right about the second half. And I thought it was gorgeously written... I just didn't actually enjoy reading it, if you know what I mean? Thank you! I found this review hard to write... It creeped me out too. Like the birds are still ALIVE in his back??!! eep! I'm glad I wasn't the only one who thought it was slow starting. I did really like the way it was written (other than the slow start obviously) but I know what you mean the book just wasn't for me.